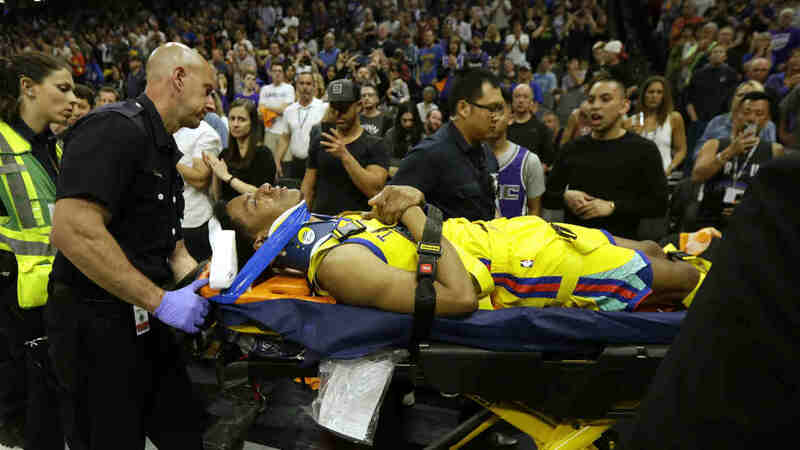 SACRAMENTO (KGO) -- Golden State Warrior Patrick McCaw has cleared all tests after he was taken off the court on a stretcher after a bad fall during a game against the Kings Saturday night in Sacramento, the team announced Sunday. The team said McCaw was transported to UC Davis Medical Center for further evaluation. The Warriors say the injury will be referenced as a lumbar spine contusion. He was expected to be released Sunday and will have a follow up with a specialist. Patrick McCaw Update: Preliminary X-ray, CT scan and MRI exams were all clear and, additionally, preliminary reviews indicate no structural injury or neural disruption. He is expected to be released later today and will undergo a follow-up review with a Specialist on Thursday. Patrick McCaw Update (Cont. ): At this point, the injury will be referenced as a lumbar spine contusion (secondary to the impact of a fall).